Home » comedy , humor , music , the essential weird al yankovic , weird al yankovic » THE ESSENTIAL "WEIRD AL" YANKOVIC on October 27th! THE ESSENTIAL "WEIRD AL" YANKOVIC on October 27th! "Weird Al" Yankovic just announced on his blog (yes Al has a blog now, in addition to his website, his Twitter account and his YouTube channel and his Facebook page... quite a technophile this guy is) that The Essential "Weird Al" Yankovic will hit the streets and online retailers on October 27th. What is The Essential "Weird Al" Yankovic? Two glorious CDs (yes: actual physical media!) of choice goodness from Weird Al's first twelve studio albums. Check out this track listing! 1. "Another One Rides The Bus"
4. "I Lost On Jeopardy"
8. "Dare To Be Stupid"
14. "The Biggest Ball Of Twine In Minnesota"
17. "You Don't Love Me Anymore"
1. "Since You've Been Gone"
4. "Everything You Know Is Wrong"
6. "Your Horoscope For Today"
7. "It's All About The Pentiums"
16. "Don't Download This Song"
18. "Trapped In The Drive-Thru"
All of that Al goodness for only $15.98! And I must say, this is quite a smart assortment from across Weird Al's career: both parodies and originals (and there's even the extra gory version of "The Night Santa Went Crazy"!). 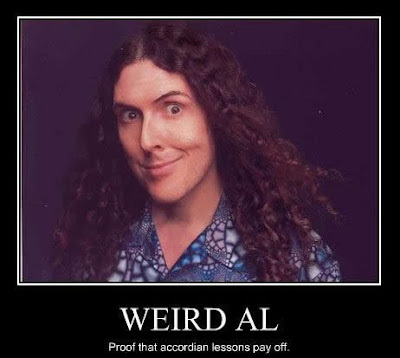 If you've yet to discover the musical genius of "Weird Al" Yankovic (where the heck have you been?!) then this set is going to be a very good starting-off point. And if you're a longtime fan like me, well you and I are gonna buy this anyway... right?!? I have a question. Is "Weird Al" married? He's very cute! Lucky enough to see Al twice and spend some time with him when I worked in radio. A genuinely nice guy and more talent than many people realize.